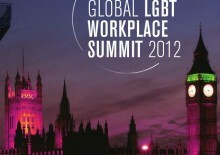 Over 350 lesbian, gay, bisexual and transgender (LGBT) global executives, leaders and allies gathered in London, July5-6, 2012, to plan strategies to advance global workplace equality at Out & Equal’s 2012 Global LGBT Workplace Summit. The conference brought together global executives and leaders from more than 26 countries, representing more than 80 different corporations, organizations and government agencies, to share their best practices and ideas for creating workplaces where LGBT people are safe, accepted, and valued. Held in London’s Park Plaza Westminster Bridge Hotel, the Summit offered rich learning opportunities for participants in four general sessions, two dozen workshops and a Gala dinner. Posted July 10th, 2012 & filed under News.